Child custody disputes often get ugly, and the fight between Alaina Giordano and Kane Snyder's is no different. There have been allegations of cheating, domestic violence, and mental health problems, but their case is getting national attention because a judge denied Giordano primary custody of her two children partly because she's fighting breast cancer. Giordano has stage 4 breast cancer which has metastasized to her bones, but her cancer is stable and isn't progressing. In August Snyder moved to Chicago for work, and the children, 11-year-old Sofia and 5-year-old Bud, stayed with Giordano in Durham, N.C.. But last month, Judge Nancy Gordon ruled that the children must move to Chicago by June 17. "The more contact [the children] have with the non-ill parent, the better they do. They divide their world into the cancer world and a free of cancer world. Children want a normal childhood, and it is not normal with an ill parent." Moving would be difficult for Giordano because she's being treated by a team of doctors at Duke Cancer Institute, but if she doesn't go to Chicago she'll only be allowed to see the children on holidays and weekends, though she can't afford the airfare. According to the New York Times, the judge asked Snyder, who is an executive at Sears Holding, Inc., if he'd move back to North Carolina so the children could see their mother regularly, but he said he wouldn't leave his job in the current economy. "It makes no sense to take them away from me because you don't know how long I'm going to live ... Everybody dies and none of us knows when. Some of us have a diagnosis of cancer, or diabetes, or asthma. This is a particularly dangerous ruling to base a custody case on a diagnosis." 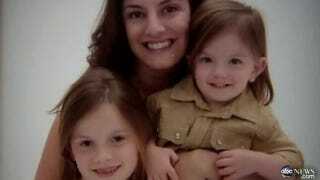 Giordano says she wants to appeal, and in the meantime she's publicizing her story via her blog, the Facebook page, "Alaina Giordano Should Not Lose Her Kids Because She Has Breast Cancer," and TV news appearances. "It's a bad precedent ... We certainly wouldn't want to have legislation suggesting that parenting is going to be contingent on being in peak health. It's not a big jump from, 'I don't want Mom to have custody because she has stage 4 cancer' to 'I don't want Mom to have custody because she's a smoker.'" It's unclear who would have been awarded custody if Giordano didn't have cancer, but if she's capable of caring for the children they shouldn't be taken from her simply because she's ill. It's true that kids, "want a normal childhood, and it is not normal with an ill parent," but worrying about their mother from hundreds of miles away isn't likely to spare the children any trauma, it will just deprive them of the limited time they still have with her.